Is Trump Emerging as 'the Grown-up in the Room'? 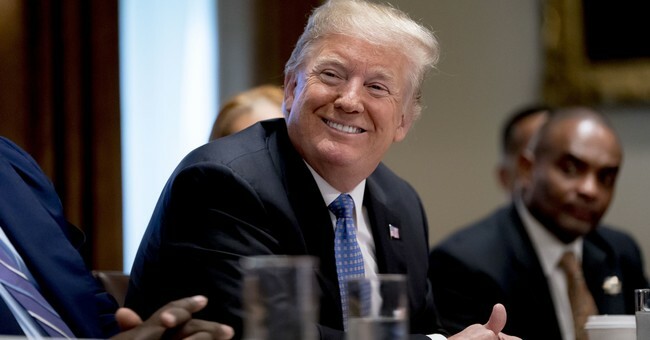 It has become a truism on the Left that Donald Trump is the epitome of a braggart and a bully: prickly, juvenile, and keen on smearing his enemies. While no one can deny that Trump's remarks and tweets are sometimes ill-considered and ad hominem, the truth is that a different side to President Trump is emerging. In the faithful execution of the duties of his office, he can be surprisingly diplomatic, subtle, and even magnanimous. The man who liberals see as a political wrecking ball may ultimately be acknowledged as one of our most consequential and constructive presidents – and, much to the Left and the media's surprise, a peacemaker par excellence. This week, President Trump followed up on his recent threats towards the Islamic Republic of Iran by publicly offering to meet with the country's leader, President Rouhani, “anytime” and without preconditions. It was a remarkable step to take, given that President Obama, who boasts of his success in repairing Western relations with Iran and allegedly shuttering the nation's nuclear program, never went so far as to meet personally with Iran's leader. Presumably he feared that such a tête-à-tête would be seen as a step too far in the appeasement of a hostile power. Trump, however, who takes an unconventional approach to foreign policy, seems to harbor no such fears. He says he is willing to meet with “anybody”, if in doing so he can advance U.S. national interests. He seems to mean it. That openness to dialogue is, of course, precisely what a devoted viewer of CNN or MSNBC, or an avid reader of the New York Times or the Washington Post, would not expect from Donald Trump. Wasn't Trump just days ago tweeting threats to Iran and its leadership? The pretentious “Trump experts” who populate the mainstream media, and who claim to have insights into the psychological dysfunctions that supposedly rule our man-child president, long ago told us that his naiveté and his belligerence could easily produce war, even nuclear war, since Trump would think nothing of either. And yet the opposite has proven to be true. While Trump does launch provocative verbal attacks against the leaders of enemy states, he also climbs down from his rhetorical fury with remarkable ease. He follows up on his barbs with peace feelers; he expresses a willingness to negotiate; he breaks old diplomatic logjams and violates long-held taboos to achieve unprecedented progress. This is how the “Little Rocket Man” Kim Jong-un went from Public Enemy No. 1, and a nuclear threat, to a potential partner in peace. This is how dozens of fallen American servicemen, buried in North Korea since the 1950s, recently came back to American soil. The important thing is that Trump's actions are not those of a bully. A bully holds grudges. A bully grinds down his victims day after day, year after year. President Trump levels insults, yes, but in doing so he isn't ending a conversation or starting a war. On the contrary, he is opening a dialogue, and often the result is a new paradigm, a new set of relationships and a reconsideration of old, entrenched interests and preconceptions, which creates the potential for progress and even mutual respect. Just ask Ted Cruz or Rand Paul. To be maligned by Donald Trump stings, to be sure, but it is far from the last word one may hear from him. Trump is eminently capable of reaching out and building bridges even with those who have said the most vile and hurtful things about him (and his family members). He meets, after all, with the staff of the New York Times. Isn't that the definition of magnanimity? When one contrasts President Trump's willingness to work with political adversaries and America's historic enemies with the rising tide of adolescent pique, smugness, and rancor we see on the Left, one begins to question the mainstream narrative about Donald Trump and to ask: just who is bullying whom? On the Left, we see people gleefully celebrating the smashing of Trump's star on the Hollywood Walk of Fame. We see liberals assaulting principled conservatives like Senator Rand Paul. We see them harassing members of the administration (and sometimes their family members) in restaurants. We see activists storming city halls, calling for the abolition of federal law enforcement agencies. We see a Republican Congressman gunned down on a baseball field, and others threatened with bodily harm. We see Antifa justifying and perpetrating violence against conservatives and even “capitalists”. We see rash talk of a “Resistance” against the administration of President Trump, and outrageous comparisons between Trump supporters and “Nazis”. We see viral campaigns on the Left to protest, boycott, shun and/or castigate anyone who doesn't tow the liberal line. We see a movement that refuses to accept that it lost the 2016 election, and that embraces the wildest, most irresponsible conspiracy theories to explain its own marginalization. Above all, we see tens of millions of Democrats and liberals, filled with loathing for Donald Trump and his supporters, who desire, and proudly admit their desire, to inflict suffering on those who dare to think (and vote) differently than they do. In the end, we must ask ourselves, à la Freud: is the leftist focus on President Trump's alleged impulsivity and childishness merely a form of projection? Liberals like to claim that their views are based on “reason” and “facts”, yes, but are they in actuality emotionally immature, irrational, and truculent themselves? Is the Left even capable of self-examination and self-control in this day and age, given the depths of derangement to which it has sunk? We may get our answers in November 2018, assuming that the “blue wave” doesn't materialize. For the Left at that stage will have to look itself in the mirror and ask: do we man the barricades and retreat further down the rabbit hole of self-righteousness, or is it time to admit the horrible truth – that we have become that which we all along professed to despise: a fanatical, narrow-minded fringe consumed by arrogance and hatred.